Wonderful place for kids and adults! We visited with our 1-1/2 year old and he enjoyed seeing the flowers and trees, strolling the grounds in his stroller and walking in the grass. There are also a few cafes where you can take a break and get a snack. The gardens are just large enough that you can see everything before a toddler gets too distracted! Bring your camera! 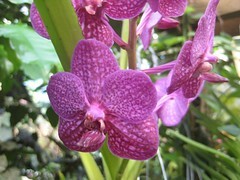 The orchid garden provides lots of amazing photo opportunities. If you are a member of another city's botanical garden, you may be able to get a discount on admission.